Your NOOK Tablet runs the Android operating system. That’s a very good thing, because Android (developed by Google) has been adopted by a wide range of smartphones and tablets; because of that, lots of people have made applications (or apps — small programs) that can run on these devices. At least officially, the only source of add-on programs for the NOOK Tablet is through the NOOK App Store. Some users of the NOOKcolor eReader, which is the older and cousin to the NOOK Tablet, have rooted their device so they can have access to most of the Android device apps without having to go through the B&N Store. If you explore this route to rooting, be aware that Barnes & Noble may void your warranty if your tablet becomes unusable. Chess. This well-designed version of the classic game lets you play against the computer at easy, normal, or hard levels. You can apply a clock to the game and select color schemes. Contacts. A manager for names, addresses, phone numbers, and e-mail addresses. Once you add a contact, you can use it in the Email app as well as the social network apps. Crossword. 56 Across: Lots of fun for logophiles. 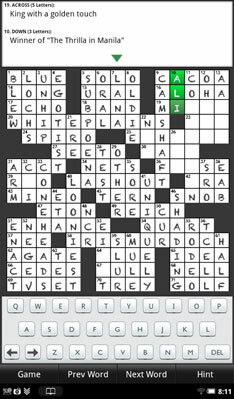 The clue appears when you choose a column or row. You NOOK Tablet even has a font that looks like handwriting. The games are challenging, though not quite up to the level of The New York Times. Music Player. With this program you can play music files that you’ve downloaded (or side loaded) to your NOOK. My Media. (Also called the Gallery in some references on the tablet and in the instruction manual.) This all-purpose picture collector and video player works with files you downloaded or side loaded to your NOOK. NOOK Friends. This is Barnes & Noble’s own version of a social network combined with a lending library. You can communicate with those you have befriended, sharing recommendations and comments and lending books — subject to certain restrictions. Sudoku. The addictive — to some — Japanese number puzzle is here on your tablet. If this is what you’re looking for, this is a fine example.